Purpose: The aim of this study was to investigate how human immunodeficiency virus (HIV) affects brain development in adolescents, what are susceptible brain regions, and how these brain structural changes correlate with cognitive abilities. Methods: We used structural magnetic resonance imaging to examine gray matter volume and cortical thickness in 16 HIV-infected children (mean age = 13.63 years) and 25 HIV-exposed uninfected children (mean age = 13.32 years), 12 of them were subjected to a 1-year repetitive magnetic resonance scan of the brain. Five neurocognitive tests were performed on each subject to assess cognitive performance in different areas. Results: Cross-sectional studies showed that the gray matter volume of HIV-infected children was widely reduced (mainly in the bilateral frontal, temporal, and insular regions, and cerebellum). The changes in cortical thickness were mainly due to thinning of the right temporal lobe and thickening of the left occipital lobe. Longitudinal studies showed that the gray matter volume reduction of HIV-infected children after 1 year mainly occurs in the advanced functional area of the right prefrontal, parietal lobe and the motor area, cortical thinning of brain regions were sensorimotor cortex and the limbic system. The gray matter volume of the bilateral cerebellum was positively correlated with the performance of the Wisconsin Card Sorting Test, while the cortical thickness of the right dorsolateral prefrontal cortex was negatively correlated with this test. Conclusion: This study found that HIV-infected pubertal children showed a delayed cortical maturation with atrophy. This abnormal pattern of cortical development may be the structural basis for cognitive impairment in HIV-infected children. Acquired immune deficiency syndrome (AIDS)-related encephalopathy is one of the most serious complications of AIDS and is more common in children than in adults (1). At present, there are nearly 2 million children living with human immunodeficiency virus (HIV) in the world, almost all newly infected children are infected through mother-to-child transmission (2). Effective antiretroviral therapy (ART) can significantly reduce mortality and the incidence of HIV encephalopathy (3). Although the children's HIV/AIDS has been transformed into chronic, controllable disease patterns, due to the HIV virus, antiretroviral drugs and a variety of environmental factors, a series of neuropsychological defects can still appear on HIV-infected (HIV+) children, sometimes even after the treatment has fully been accepted (4). Currently, some studies have reported and summarized the neurocognitive impairment and behavioral abnormality in children infected with HIV. For example, language barriers, delayed motor development, poor school performance, etc., and some may even have psychological problems such as anxiety and depression (5, 6). Although highly active antiretroviral therapy can improve the cognitive function of HIV+ children in the long run (7), there are also studies showing that cognitive impairment will exist for a long time (8). It will affect their future learning, work performance and social practice, we need to focus on long-term outcomes of nervous system development to inform treatment options and guide early intervention treatment strategy to prevent deterioration of cognitive function. The rapid development of neuroimaging has provided us with a powerful tool for studying brain development in children. Current structural magnetic resonance imaging (MRI) studies have observed some changes in brain structure in HIV+ children and adolescents, including subcortical volume, shape deformation (9), gyrification, and overall or regional gray matter volume (GMV) reduction (10, 11), but there are very few longitudinal research on cortical development. A longitudinal study observed persistent damage to human white matter development in HIV+ children, regardless of whether they received antiretroviral therapy or viral suppression at an early stage (12). Furthermore, many studies have used the emerging MRI technology to reveal the characteristics of brain structure, function and the influence of cognitive factors in children with HIV/AIDS, but the future impact of these developmental abnormalities are still unclear, brain regions vulnerable to HIV or antiretroviral drugs have also not been identified (13–15). Some studies have shown that the developmental maturity of brain structure is consistent with the development of individual cognitive ability (16, 17). We hypothesized that HIV would have less influence on the development of brain regions related to primary functions such as sensory and motor domains, but have a greater impact on the development of brain regions related to advanced cognition such as decision-making and reasoning. We attempted to conduct cross-sectional and longitudinal studies through high-resolution structural MRI to observe which brain regions HIV may preferentially affect and to combine multiple domains of neuropsychological cognitive testing to observe the correlation between brain structural changes and cognitive ability. We recruited 16 HIV+ adolescents (mean age ± SD, 13.63 ± 1.83 years; range, 11–17 years; mean CD4 count ± SD, 558.87 ± 199.89 cells/mm3; range, 276–940), the viral load of them did not reach the lower limit of detection (<20 copies/ml). The presence of HIV+ children was confirmed by Western blot. We also recruited 25 age- and gender-matched HIV-Exposed Uninfected (HEU) subjects (mean age ± SD, 13.32 ± 1.62 years; range,11–17 years). All HIV+ adolescents were infected by mother-to-child transmission during pregnancy, childbirth or through breastfeeding. HEU subjects' fathers, mothers, or parents also suffered from HIV infections. The socioeconomic status, cultural background and ethnic background of the two communities were similar. Detailed population information and clinical measures are listed in Table 1. All subjects were enrolled from Training Centre of AIDS Prevention and Cure of Hubei Province. The inclusion criteria for HIV+ subjects included HIV acquisition during the fetal or neonatal period, currently treated with ART, and right-handed. For the control subjects, the inclusion criteria included confirmation of HIV negative status by ELISA and right-handedness. Table 1. Demographics and results of neuropsychological tests. Exclusion criteria for all subjects included those younger than 11 years of age or over 17 years of age, with acute medical illnesses, current or past medical or neurological diseases, psychiatric illnesses, mental retardation, current alcohol or drug abuse, HIV encephalopathy and opportunistic infections, MRI contraindications, claustrophobia, metabolic disorders or other brain diseases (not AIDS-related). We used the exclusion criteria, which included HIV-related encephalopathy to rule out space-occupying masses, other lesions or obvious cortical atrophy in the brain of HIV+ adolescents, so that we got the difference in anatomical gray matter covariance between the two groups. Only one individual in the HIV+ group was excluded because of age 7. For the control subjects, the exclusion criteria also included serious educational difficulties and a chronic medication other than asthma medication. The study was approved by the Medical Ethics Committee of Zhongnan Hospital of Wuhan University, and a written and informed consent was made from all participants or their guardians in accordance with the Helsinki Declaration of 1975 (and as revised in 1983), following a complete description of the measurements. These methods were carried out in accordance with the approved guidelines and regulations. In order to more comprehensively assess the cognitive abilities of the subjects, we selected five tests based on the Frascati criteria (21). (1) Word Semantics Test: to examine written language comprehension, especially at the level of sentences. (2) Verbal Working Memory Test (present audio): comes from the digital memory span subtest of Wechsler Intelligence Scale. (3) Wisconsin Card Sorting Test: to examine executive control capabilities. (4) Picture Memory Test. (5) Indicate the Midpoint Test of the Line Segment: focus on sensory perceptual and motor skills. We conducted all tests online using the professional “Multi-Dimensional Psychology” platform (http://www.dweipsy.com/lattice/). All these tests and MRI scans were carried out within a month of study enrollment for each participant. High-resolution T1-weighted structural MRI scans were acquired on the 3.0 T scanner (Siemens, Prisma, Germany), which was stationed at the Department of Radiology, the Zhongnan Hospital of Wuhan University, using a multi-echo magnetization prepared rapid gradient echo (MPRAGE) pulse sequence (repetition time = 5,000 ms, echo time = 2.88 ms, inversion time = 700 ms, flip angle = 4°, slice thickness = 1.00 mm, and matrix size = 256 × 256) that yielded 176 axial slices with an in-plane resolution of 1.0 × 1.0 mm. We visually inspected the cerebral microbleeds foci measured by susceptibility-weighted imaging (SWI), and white matter hyperintensity by T2- fluid-attenuated inversion recovery (FLAIR) images through all the subjects. We also excluded any subject that exhibited obvious gray and white matter lesion imaged by SWI and FLAIR. In this study, we analyzed two morphological brain measures, the gray matter volume [via voxel-based morphometric (VBM) analysis] and cortical thickness (CT) analysis. All data processing uses Statistical Parametric Mapping software (SPM12; Wellcome Department of Cognitive Neurology, London, UK; http://www.fl.ion.ucl.ac.uk/spm) and Computational Anatomy Toolbox (CAT12, http://dbm.neuro.uni-jena.de/vbm/) based on MATLAB (MathWorks, Natick, MA, USA). The data preprocessing mainly included: (1) experienced radiologists screen data with obvious abnormalities, excluding data with large artifacts and obvious lesions; (2) the original T1 images were manually reoriented to match the AC-PC plane, (3) segmented into gray matter, white matter, and cerebrospinal fluid using the standard unified segmented model (18, 19) in the CAT12, (4) nonlinearly normalized into standard Montreal Neurological Institute (MNI) space using a pediatric template for 12- to 18-year-old children from the Imaging Research Center at Cincinnati Children's Hospital Medical Center (CCHMC), (5) the normalized segmentations were then modulated to ensure that the relative volumes of gray matter were retained, (6) the modulated images were re-sampled to 1.5 × 1.5 × 1.5 mm3 and smoothed with an 8 mm full-width at half-maximum (FWHM) Gaussian kernel, (7) to control for deviations, we included an additional quality check based on heterogeneity measurements of the sample as implemented in CAT; using the covariance of voxel-based data to identify the outliers who were two or more standard deviations outside of the GMV sample distributions, and one patient and one control were excluded based on this criterion, (8) finally, exclude voxels with a gray matter value < 0.15 to eliminate the potential edge effects between the gray matter and white matter. The CT was also computed by using the CAT12, all the parameters were set by default in the CAT12, except for the brain template using a pediatric template for 12- to 18-year-old children from the Imaging Research Center at Cincinnati Children's Hospital Medical Center (CCHMC) (https://irc.cchmc.org/software/pedbrain.php). Briefly, this automated method (20) allows for central surface reconstructions and CT measurement in one step, then the topological defects of cortical surface mesh were repaired by using a spherical harmonic method. Prior to the statistical analyses, the individual CT maps were smoothed by using a Gaussian filter with full-width at half-maximum of 15 mm. For the longitudinal analysis of GMV and CT, we also used the CAT12 default parameters with the pediatric template and performed the analysis under the longitudinal analysis module to obtain subtle changes at the individual level between the two-time points (1 year before and after). For clinical and behavioral data, statistical analysis was conducted using IBM SPSS version 20 (IBM SPSS Inc., Chicago, IL, USA) and G*Power 3.1.9.3. The significance threshold was set to p < 0.05. For the brain morphological parameters (gray matter volume and cortical thickness), cross-sectional between-group comparisons were tested in SPM12 using independent two-sample t-tests, with age and gender as covariates, longitudinal comparisons were carried by flexible design 2 × 2 analysis of variance (ANOVA). The significance threshold was set to p < 0.05 with a cluster level Family Wise Error (FWE) correction and threshold-free cluster enhancement (TFCE) multiple comparison-corrected. For demographic and clinical data, the HIV+ and HEU controls were comparable on age, gender, and education (p > 0.05, Table 1). For cognitive testing, the HIV+ group performed significantly worse in the Wisconsin card classification test (execution and abstraction functions) than their HEU controls (p = 0.015, Table 1). In addition, we also noted that 5 of the adolescents in the HIV+ group scored at least 2 items below the mean of the control group minus a standard deviation of one time, which can be diagnosed asymptomatic neurocognitive impairment according to Frascati criteria (21). We first investigated the between-group differences on GMV by using VBM. 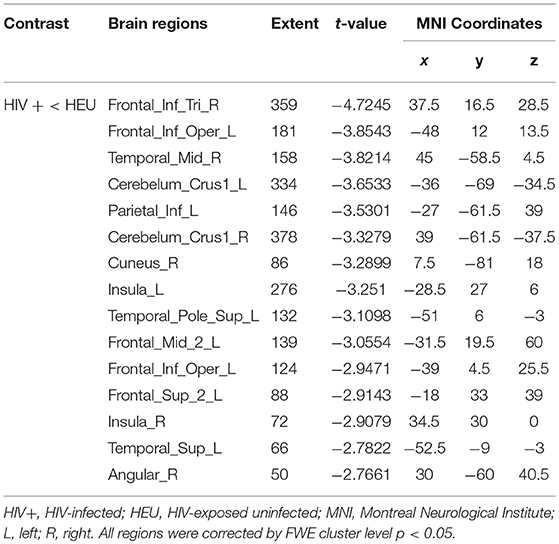 This analysis revealed a significant reduction in the GMV across broad regions, including bilateral superior cerebellar, frontal, temporal, insular, angular regions, and right cuneus, in the HIV+ individuals, these results were corrected by FWE cluster level p < 0.05 (Table 2; Figure 1). Table 2. Between-group comparison on gray matter volume. Figure 1. Between-group comparison on gray matter volume (GMV). Clusters showing significantly (corrected P < 0.05) lower (blue) and higher (red) GMV in HIV+ children compared to controls. But the red region isn't successfully positioned in the template. This figure was rendered using BrainNet Viewer (http://www.nitrc.org/projects/bnv/). We next reported the between-group differences on surface-based metrics of CT. Individuals with HIV showed significantly thicker cortices in left occipital (the middle and inferior gyri) and right olfactory sulcus, also, significantly thinner cortices in the temporal (the middle and the pole parts) and orbitofrontal regions. The results were corrected by FWE cluster level p < 0.05 (Table 3; Figure 2). Table 3. Between-group comparison on cortical thickness. Figure 2. Between-group comparison on cortical thickness (CT). Clusters showing significantly (corrected P < 0.05) lower (blue) and higher (red) CT in HIV+ children compared to controls. These figures were rendered using BrainNet Viewer (http://www.nitrc.org/projects/bnv/). Based on the cross-sectional results, an important aim of this study is to investigate the longitudinal brain develop trajectory. Using a 2 × 2 ANOVA, we then contrasted the development patterns between the two groups. For the GMV, generally, the HIV+ group showed changes in GMV over a wider range of brain regions and was dominated by a significant decrease in GMV after 1 year. 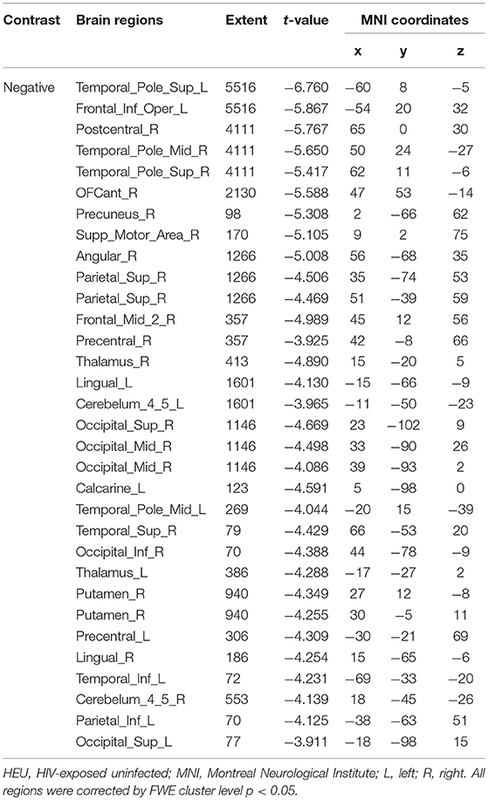 These regions mainly included decreased GMV in the bilateral frontal, supplementary, parietal, and occipital regions; and increased GMV in the right inferior temporal, inferior occipital and orbital frontal cortex (OFC) regions (Table 4; Figure 3A). Table 4. Volume change of gray matter in HIV+ group after 1 year. Figure 3. Longitudinal changes on gray matter volume (GMV) after 1 year. Clusters showing significantly (corrected P < 0.05) lower (blue) and higher (red) GMV changes after 1 year. (A) Clusters showing many lower and few higher GMV regions in HIV+ group children. (B) Clusters only showing significantly lower GMV regions in HEU group children. (C) Put together the two groups for statistical analysis and showing significantly changes of GMV after 1 year. (D) In assessing the time and interactions between the two groups, clusters showing widely areas of GMV significantly reduced. These figures were rendered using BrainNet Viewer (http://www.nitrc.org/projects/bnv/). The HEU group showed only areas with significantly reduced GMV after 1 year, mainly in the bilateral temporal lobe, left inferior frontal gyrus, right anterior OFC, and right parietal lobe (postcentral, angular, and superior parietal gyrus) and right occipital lobe, part of the basal ganglia nuclei (putamen, thalamus), bilateral cerebellum (Table 5; Figure 3B). Table 5. Volume change of gray matter in HEU group after 1 year. The two groups were put together for statistical analysis and showed that after 1 year, the GMV of multiple brain regions increased significantly, mainly including bilateral frontal lobes (the right OFC, the left inferior frontal cortex, the right precentral cortex, etc), and the right temporal lobe, bilateral upper cerebellar and parietal-occipital lobes, right amygdala, and thalamus; areas of markedly reduced GMV mainly include right medial OFC, left supplemental motor area, left cingulate gyrus, and temporal-occipital cortex (Table 6; Figure 3C). In assessing the time and interactions between the two groups, it was shown that the volume of gray matter in a wide area was significantly reduced, mainly including the bilateral parietal lobes (above gyrus, supramarginal gyrus, and precuneus), and bilateral multiple other lobes; significant gray matter volume increase only in the right cingulate anterior (Table 7; Figure 3D). Table 6. Volume change of gray matter in HIV+ and HEU groups after 1 year. Table 7. Interactions between groups and time points of gray matter volume. For the cortical measures, the longitudinal results showed extensive cortical thinning in both the HIV+ and HEU groups after 1 year. In the HIV+ group, the bilateral cingulate gyrus, the postcentral gyrus, the parietal lobe and the left superior frontal gyrus, the calcarine, the angular gyrus, the precentral gyrus, the inferior frontal gyrus, the right paracentral lobes, the frontal pole, the central sulcus, and the inferior parietal lobule were displayed (Table 8; Figure 4A). Table 8. 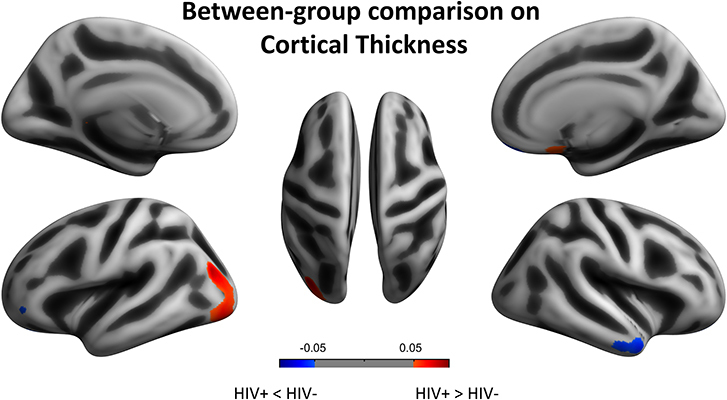 Cortical thickness change in HIV+ group after 1 year. Figure 4. Longitudinal changes on cortical thickness (CT) after 1 year. Clusters showing significantly (corrected P < 0.05) lower (blue) and higher (red) CT changes after 1 year. (A) Clusters showing lower and higher CT regions in HIV+ group children. (B) Clusters showing significantly lower and higher CT regions in HEU group children. (C) Put together the two groups for statistical analysis and showing significantly lower regions more obviously than higher regions of CT after 1 year. (D) In assessing the time and interactions between the two groups, clusters showing widely areas of CT significantly reduced. The HEU group showed significant cortical thinning mainly around the bilateral central sulcus and mainly in the frontal lobe, left occipital lobe and the right temporal lobe, significantly thickened cortex mainly in the left olfactory sulcus, orbital gyrus and the right inferior orbital sulcus and the right gyrus rectus (Table 9; Figure 4B). Table 9. Cortical thickness change in HEU group after 1 year. The two groups were put together for statistical analysis, the areas of the cortical thickening were more obvious, mainly in the bilateral middle occipital gyrus, the parietal lobe (angle gyrus), the frontal lobe (near the right inferior frontal gyrus) and the right middle temporal gyrus. 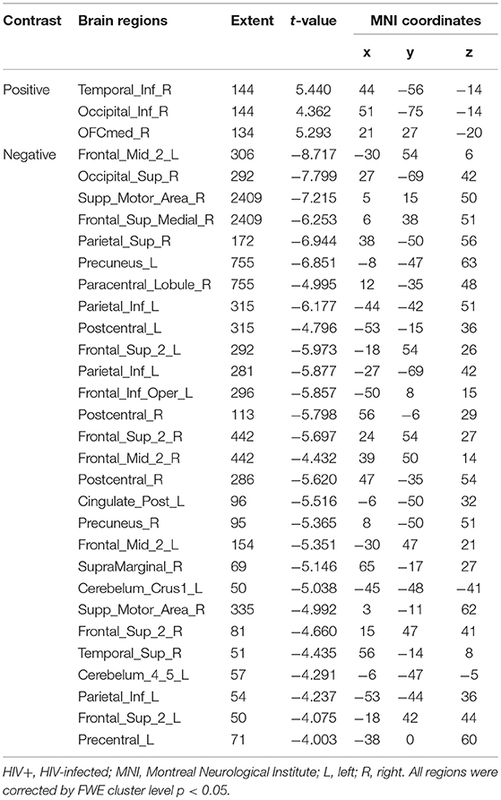 Cortical thinning was mainly in the right frontal lobe (Table 10; Figure 4C). In the evaluation of the time and the interaction between the two groups, the cortical thinning in a wide area was shown, mainly around the bilateral central sulcus, the insular, the frontal lobe (mainly in the middle gyrus), the cingulate sulcus. Significant cortical thickening only showed in bilateral orbital gyrus and the right parahippocampal gyrus (Table 11; Figure 4D). Table 10. 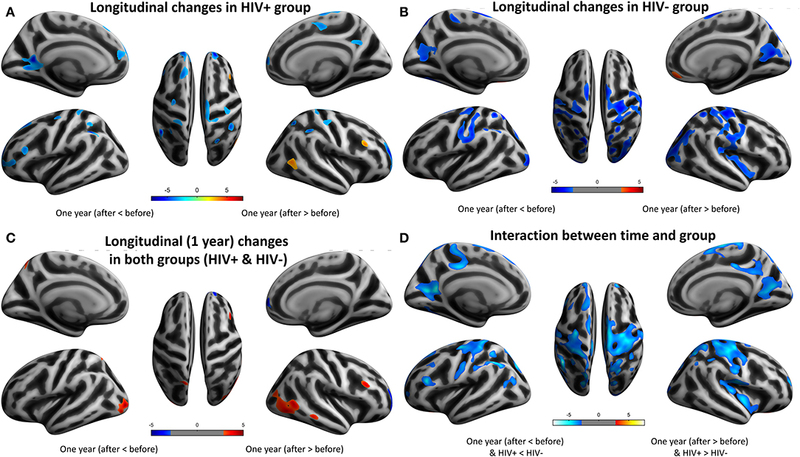 Cortical thickness change in HIV+ and HEU groups after 1 year. Table 11. Interactions between groups and time points of cortical thickness. Finally, we analyzed the association between behavioral performance and brain morphological measures in HIV+ adolescents. Because there was a significant difference in Wisconsin Card Classification Test between the two groups, we performed a nonparametric correlation analysis on the Wisconsin Card Classification scores of the HIV+ group and the morphological measures with significant between-group differences on the cross-sectional analysis. For the GMV, the gray matter volume of the bilateral cerebellum in the HIV+ group was significantly positively correlated with the Wisconsin Card Classification Test score (r = 0.681, p = 0.005). 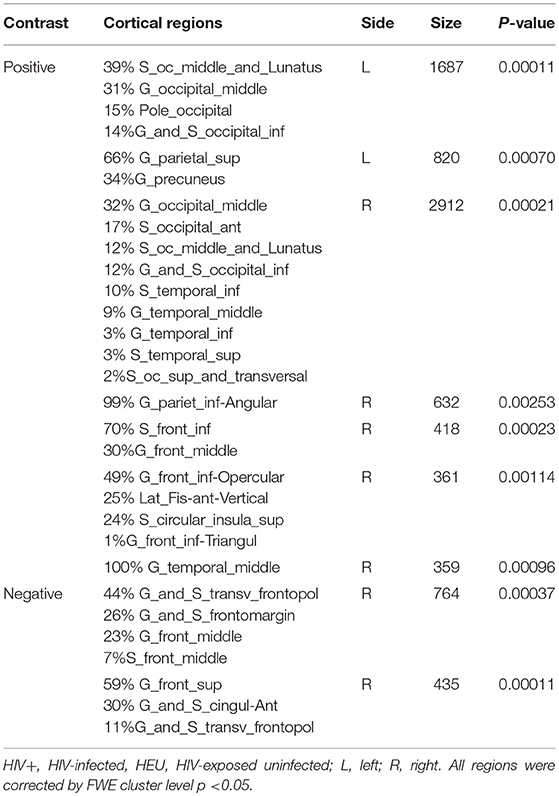 For the CT, the cortical thickness of HIV+'s right rostral middle frontal (r = −0.646, p = 0.009) and right superior frontal gyri was significantly negatively correlated with the Wisconsin Card Classification Test score. Cross-sectionally, we found a wide reduction in cortical volume and changes in cortical thickness with thinning of the right temporal lobe and thickening of the left occipital lobe in HIV+ individuals during adolescence. Longitudinally, the reduction in gray matter volume and thinning of the cortex in HIV+ individuals occurred mainly in different functional areas of the frontal and parietal lobe, which was significantly different from the pattern of their HEU controls. Cross-sectionally, the alterations in the advanced cortices including the OFC and primary sensorimotor cortices as found here are generally consistent with our hypothesis and earlier reports (22, 23). The HIV virus can rapidly enter the central nervous system (CNS) and cause encephalitis within a few days after the exposure (24). In the early stages of the disease, HIV induces the CNS inflammatory T-cell response with vasculitis and leptomeningitis, directly damage oligodendrocytes, neurons, and white matter (25). The same process can be observed in the cerebral cortex of AIDS patients, thereby inducing neuronal apoptosis. Immunoreactive gliosis and neuronal loss can even cause diffuse poliodystrophy (26, 27). These pathological changes should explain why our GMV cross-sectional results only show a decrease in gray matter volume in multiple brain regions, mainly in the bilateral frontal, temporal, insular, and cerebellar cortical regions. A major novelty of this study is the using of longitudinal structural brain data to examine brain development during early puberty after HIV exposure. Longitudinally, we found that the brain maturation in HIV-infected and non-HIV-infected children follows a general pattern, but unique changes have taken place in terms of developmental speed, spatial range, etc. The human brain decreases its gray matter in late childhood or adolescence in typical healthy development (28, 29). Our longitudinal VBM results also showed this trend, however, the GMV loss pattern of HIV+ children are significantly different from that of the controls over 1 year, the topographies of this loss including the right frontal, superior parietal, and sensorimotor regions. Changes in the OFC have been suggested with pronounced negative emotions (30). The difference in volume changes in the right OFC after 1 year suggests that this brain area may be one of the key brain areas affected by HIV. The OFC is an important limbic brain region responsible for emotion, decision making and reward evaluation, which collectively with basal ganglia, amygdala and the medial prefrontal cortex form an limbic-emotion circuit (31). It is generally believed that the functional imbalance of this circuit is related to the pathogenesis of obsessive-compulsive disorder (32, 33). The neuroanatomical features are significantly controlled over genetic and environmental factors. GMV is a function of surface area and cortical thickness, the cortical surface area has been reported to more likely to be regulated by a genetic factor than the cortical thickness (34). A human study has shown that a decrease in synaptic density in healthy children between the ages of 2 and 16 years is accompanied by a slight decrease in neuronal density (35). We can consider that thinning of the cortex during adolescence represents the concurrent process of synapses, axons, dendritic pruning, and myelination. It plays an important role in improving the connectivity between brain networks and improving signal transmission efficiency. The thinning of association cortices is seen as a reliable marker of maturity in healthy children (36, 37). 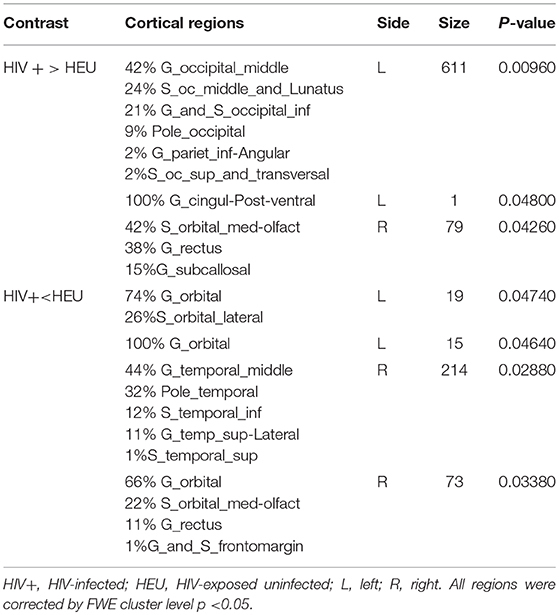 The difference in cortical thickness between children with HIV and uninfected HEU children was predominantly in the association cortex with a few areas of excessive thinning, which may be the result of excessive synaptic pruning or abnormal plasticity. However, cross-sectional results are unavoidably affected by individual differences and groups. Our longitudinal study will overcome these limitations. Neuroimaging has provided evidence of temporal hierarchy on typical brain development, with the primary cortices develop first and the association cortices continue to develop until the early three-decade of life. Sowell et al. mapped gray matter density in 176 typical development individuals aged 7 to 87 years and found that there was a significant non-linear decrease in gray matter density with age, especially on the lateral/dorsal frontal and parietal cortices. The primary sensorimotor regions, such as the visual, auditory, and the somatomotor cortices, begin to myelination at an early stage and exhibits a more linear developmental pattern, while the myelinization of the advanced functional cortex of the frontoparietal regions can continue into adulthood. In particular, the language cortex at the temporal cortex has the longest maturation process (16), and finally mature brain regions (frontal lobes) that involve advanced functions such as executive function and attention, but in this process not some brain regions are fully mature and other brain regions begin to develop (17). These studies indicate that the order of cortical maturation is consistent with the development of related cognitive abilities. Cortical thinning should occur first in the sensorimotor area, followed by the associated area, and finally in the more advanced cortical area. In our study, HIV+ children showed cortical maturation in multiple brain regions from primary to advanced functional regions after 1 year, but the brain regions involved were mostly sensory motor cortex and limbic systems. The range and extent of the HIV+ group's cortical maturation are significantly lower than that in HEU children. This pattern of high-function-associated cortical lagging development (especially in the left parietal lobe and bilateral occipital lobes) may be the basis for the manifestation of neurocognitive abnormalities and atypical brain development. Cortical morphometry of neuroimaging has revealed atypical development in several brain diseases including schizophrenia and hyperactivity disorder, etc. (38). In a longitudinal study of children with schizophrenia, the developmental pattern of temporally and spatially thinning of the cerebral cortex was shown and was first detected in the parietal cortex associated with visual space and associative thinking. And this pattern of gray matter loss is related to the severity of mental symptoms (39). However, Shaw et al. showed that 223 children with attention-deficit/hyperactivity disorder (ADHD) showed that the age at which the peak cortical thickness was reached significantly later than that of normal children, especially in the prefrontal cortex. It indicates that there is a significant development delay in cortical maturation in children with ADHD (40). The different results of these studies suggest that changes in the basic maturation model of the cerebral cortex may be the basis of neurodevelopmental disorders. This process, together with social psychology and environmental factors, affects the development of individual cognitive abilities. The independent and interactive effects of these various factors may play an important role in brain structural changes and HIV-associated neurocognitive disorders in HIV+ patients. In the future, more in-depth clinical and basic research is needed to determine the pathophysiological mechanisms and potential therapeutic targets (41, 42). Finally, we need to emphasize the role of white matter damage in the morphometric changes of HIV+. These cortical morphological changes found in this study may be partly due to the contribution of white matter damage. The axonal and myelin development of white matter has an important influence on the coordinated development of the gray matter. Recently, several studies have also pointed out that damage of the white matter structural connectivity that link the frontal, temporal, and occipital regions, as we reported, constitutes the basis of damage in HIV transmitted infection children, which suggests that the white matter damage may also be the basis for abnormal development of gray matter morphology in these population, but the relationship between them is still an open question, both for the typical development and HIV infected children. This relationship can be further analyzed and explored in future research (12, 43–45). There are several limitations in this study. Firstly, because the data of this type of population is extremely rare, the sample size is very small, even if this study is obtained by using an unique opportunity. Secondly, the results reported in this paper only involved 1-year follow-up, and further follow-up is needed to obtain a detailed description of their developmental trajectories, and relevant research is continuing. In addition, because the subjects in this study were from different regions of the country, it is not very easy to completely and accurately obtain their previous complications. This cross-sectional and longitudinal study found that HIV-infected pubertal children showed a delayed cortical maturation (mainly in the left parietal lobe and bilateral occipital lobe) with atrophy (mainly occurs in the right frontal lobe, parietal lobe of the higher functional areas and multiple motor areas). This abnormal pattern of cortical development may be the structural basis for cognitive impairment in HIV+ children. Longer-term longitudinal studies are needed in the future to verify and improve this conclusion. XY designed this study and wrote the paper, LG analyzed data, and contributed to writing of the paper. XY, HW, ZY, JF, JC, and QL performed experiments together. HX and XG guided the entire experimental process. The author(s) disclosed receipt of the following financial support for the research, authorship, and/or publication of this article: This study has been supported by the National Natural Science Foundation of China (under Grant Nos. 81771819 and 81571734), National key research and development plan of China (Project 2017YFC0108803), Zhongnan Hospital of Wuhan University Science, Technology and Innovation Seed Fund (Projects cxpy2017048 and cxpy20160057), and the Fundamental Research Funds for the Central Universities (Projects 2042017kf0284 and 2016060605100525). We thank all the children and their parents for being willing to take part in this study. AIDS, acquired immune deficiency syndrome; HIV, human immunodeficiency virus; HIV+, HIV-infected; MRI, magnetic resonance imaging; GMV, gray matter volume; HEU, HIV-exposed uninfected; VBM, voxel-based morphometric; CT, cortical thickness; MNI, Montreal neurological institute; FWE, Family Wise Error; TFCE, threshold-free cluster enhancement; OFC, orbital frontal cortex. 2. World Health Organization. Global update on the Health Sector Response to HIV, 2014, World Health Organization. (2014). 26. Soontornniyomkij V. Neuropathology of HIV-1 Disease[M]. New York, NY: Springer (2017). p. 143–208. Copyright © 2019 Yu, Gao, Wang, Yin, Fang, Chen, Li, Xu and Gui. This is an open-access article distributed under the terms of the Creative Commons Attribution License (CC BY). The use, distribution or reproduction in other forums is permitted, provided the original author(s) and the copyright owner(s) are credited and that the original publication in this journal is cited, in accordance with accepted academic practice. No use, distribution or reproduction is permitted which does not comply with these terms.